Nuclear receptors (NRs) are ligand-dependent transcription factors found in many species that regulate the expression of important target genes involved in a spectrum of developmental and physiological processes. In addition to ligand binding, the transcriptional activities of NRs are also modulated through a range of protein-protein interactions with coregulatory proteins, either with coactivator or with corepressor functions (1-4). The ligand binding domain (LBD) of NRs is responsible for both ligand recognition and regulation of protein-protein interactions, notably with coregulatory factors. Upon agonist binding, conformational changes are induced within the LBD, particularly the activation function-2 (AF-2) region, which leads to the dissociation of corepressors and recruitment of the coactivator complex, ultimately leading to transcriptional activation from specific DNA response elements1. NRs represent important targets for therapeutic interventions for diseases including cancer, inflammation and metabolic diseases. Understanding xenobiotic interactions with NRs is also important in the context of endocrine disruptors and environmental toxicity assessment. One NR with the ability to associate with a wide range of xenobiotics, including pharmaceutical agents, natural products and environmental chemicals is pregnane X receptor (PXR). Activation of PXR regulates the expression of xenobiotic metabolizing enzymes such as cytochrome P450 enzymes (CYP3A4, CYP2B6, and CYP2C8/9) and glutathione-S-transferases, as well as important drug transporters (P-glycoprotein, multidrug resistance protein as well as others). 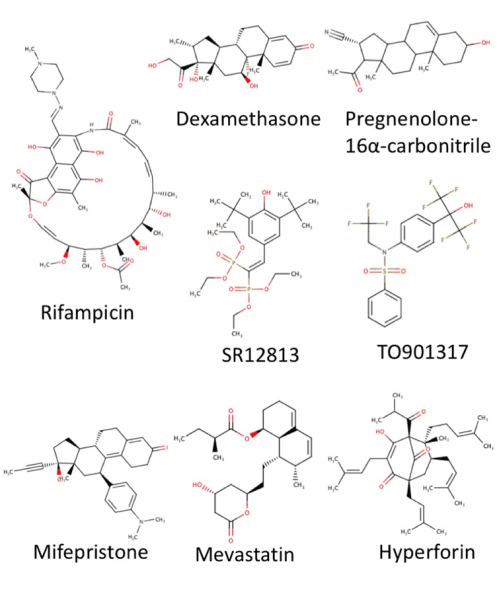 Since the CYP enzymes metabolize the majority of clinically important drugs, inadvertent up-regulation by PXR agonists may increase metabolism and excretion of other co-administered therapeutic agents and cause undesirable drug-drug interactions or the generation of toxic drug metabolites. Thus, it is important to identify molecules that interact with PXR early in the drug development process (1). The PXR LBD is unusually divergent across species, compared to other NRs, with only 50% sequence identity between mammalian and non-mammalian PXR sequences; other NRs tend to have corresponding sequence identities at least 10-20% higher (5). 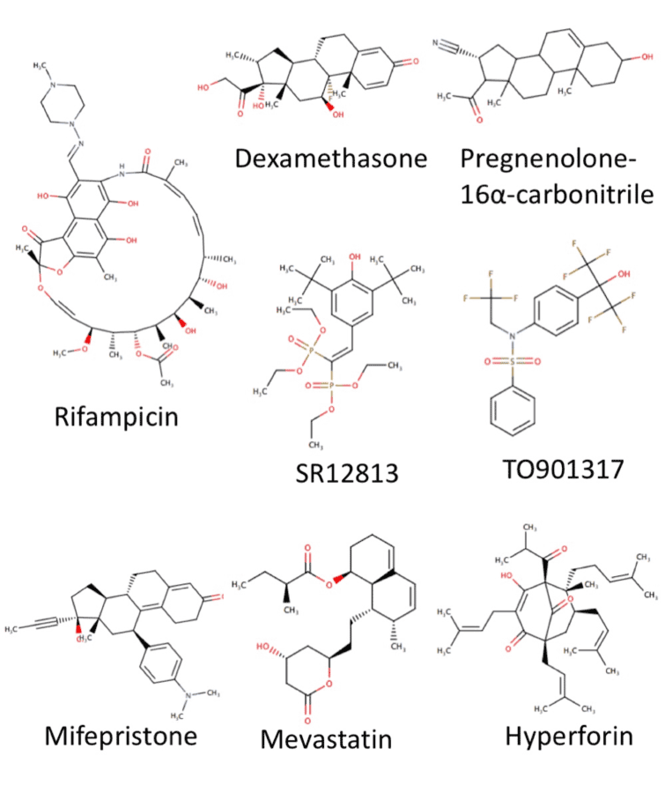 The ability to extrapolate PXR activity across laboratory animal species to humans is an important aspect of addressing the the potential of drug-drug interactions with a new drug lead; this is made more difficult with the dramatic species differences in LBD structure noted above. In this study, we examined a small group of known PXR agonists (see Figure) for their ability to regulate the activity of human, monkey, dog, rat and mouse orthologues of this receptor. We show that there is indeed a great deal of species differences in both potency and efficacy of chemicals examined, with a unique profile observed for each orthologue. Ai, N., Krasowski, M.D., Welsh, W. J., and Ekins, S.(2009) Understanding nuclear receptors using computational methods, Drug Discov Today 14, 486-494. Wagner, M., Zollner, G., and Trauner, M. (2011) Nuclear receptors in liver disease, Hepatology 53, 1023-1034. Woods, C. G., Heuvel, J. P. , and Rusyn, I. (2007) Genomic profiling in nuclear receptor-mediated toxicity, Toxicol Pathol 35, 474-494. Omiecinski, C. J., Vanden Heuvel, J. P., Perdew, G. H., and Peters, J. M. (2011) Xenobiotic metabolism, disposition, and regulation by receptors: from biochemical phenomenon to predictors of major toxicities, Toxicol Sci 120 Suppl 1, S49-S75. Ekins, S., Reschly, E. J., Hagey, L. R., and Krasowski, M. D. (2008) Evolution of pharmacologic specificity in the pregnane X receptor, BMC Evol Biol 8, 103.